The new Core-based MacBook Pros have arrived, a few months after Intel introduced the 2010 Core processors at the Consumer Electronics Show. The new Core processors are used inside the 15- and 17-inch models. And while we’ll still need to run thorough tests on these new systems, the processors that power the latest MacBook Pros could possibly usher in a new standard in Mac laptop performance. The $1799 15-inch MacBook Pro uses a 2.4GHz Core i5 520M processor, while the $1999 15-inch model and the $2299 17-inch model both use a 2.53GHz Core i5 540M. A 2.66GHz Core i7 620M processor is found inside the $2199 15-inch MacBook Pro; the same processor is available as a built-to-order (BTO) option on the 17-inch model for an extra $200. The Core processors also use Hyper-Threading. By using four virtual cores, Hyper-Threading allows each of the two cores on these chips to process two threads at once. Manufactured using the 32-nanometer process, the Core processors are smaller and more power-efficient than the 45-nanometer Core 2 Duo chips. 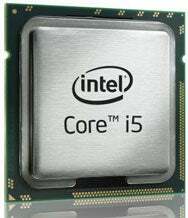 There’s actually a third class of processor in the Core line, the Core i3. Considered a “first level” processor by Intel, the Core i3 is a dual-core processor available at 3.06GHz and 2.93GHz, and comes with Intel HD Graphics built in. Apple, however, decided not to use the Core i3 in its 13-inch MacBook Pro, instead sticking with the Core 2 Duo processors at 2.4GHz and 2.66GHz, and Nvidia GeForce 320 integrated graphics. An Apple representative said that the Core i3 doesn't match the combination of features found in the new 13-inch MacBook Pro’s Core 2 Duo chip. Chances are that the new Core i5 and i7 MacBook Pros will outpace their predecessors. But by how much? Apple says that the new 15- and 17-inch MacBook Pros can be up to 50 percent faster than the previous Core 2 Duo-based MacBook Pros. That’s a pretty hefty claim that we’re currently testing in our lab. Though it uses different chips, a look at the iMac could give us some insight as to the Core i5 and i7’s performance versus the Core 2 Duo. The desktop version of the Core i5 made its debut in Apple’s product line when the 27-inch 2.66GHz Core i5 iMac ( ) was release last November. When we reviewed the Core i5 iMac, it recorded a Speedmark 6 score of 209, the fastest score we’ve ever recorded for a standard-configuration Mac. The Core i5 iMac was 29 percent faster than its 27-inch sibling, which uses a 3.06GHz Core 2 Duo processor. There are other differences between the new MacBook Pros and their predecessors that will influence performance. The Core processor has an integrated memory controller—there is no longer a front-side bus like the one used by the older Core 2 Duo-based MacBook Pros (and the new 13-inch MacBook Pro). The integrated memory controller should allow for faster access to memory. The new MacBooks also feature new graphics subsystems, which not only boost performance, but also extend battery life. Macworld Lab is working on testing the new MacBook Pros. Keep an eye out for Speedmark 6 results and our full review and mouse ratings of all six new systems coming soon. Updated at 4 p.m. PT to correct information about the desktop Core i5.